Cognitive-Behavioral Therapy (CBT) is an extensively researched treatment approach that has gained widespread application in the treatment of addictions and mental disorders. 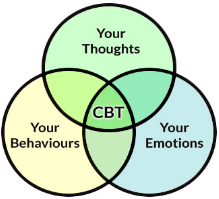 CBT is structured, goal-oriented, and focused on immediate problems. It is a flexible, individualized approach that can be adapted to a wide range of clients and a wide range of treatment settings and formats. Address common barriers to treatment implementation. Presenter: Tracy L. Hutchinson Tracy is a Licensed Professional Counselor (LPC), Master Addictions Counselor (MAC), and Colorado Addictions Counselor (CAC III). She has been working in the field of Addictions and Mental Health for the past 38 years, in a variety of settings, levels of care and populations. Currently, through her Counseling and Consulting private practice, Tracy’s primary focus is as a trainer for Colorado Addictions Counselor (CAC) courses. Additionally, she is a facilitator of personal, professional, team building and spiritual development retreats. She is the author, narrator and co-producer of "Levels Meditation" 2001".